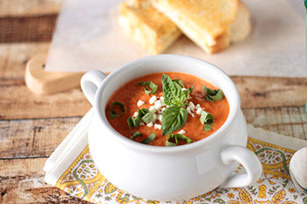 You'd be surprised how easy it is to make an amazing Mediterranean-style soup. Ours includes fire-roasted tomatoes, crumbled feta and fresh basil. Heat olive oil in a medium saucepan over medium heat. Add onions and garlic, sauté for 4-5 minutes. Add tomatoes, simmer gently for 15 minutes. Reduce heat to low, add cheeses and stir until melted. Add salt and pepper. Use an immersion blender to puree soup to desired consistency. Ladle into bowls and serve topped with chopped fresh basil and additional feta cheese crumbles (optional).